If you’re not careful, your thoughts can take you to a very dark and lonely place, and it can happen very quickly. In the days following my diagnosis, it was very difficult to remain focused on anything except the fact that I was now facing cancer. Everywhere I looked I saw people who (as far as I could tell) were not facing cancer, and it just didn’t seem fair. It was a constant struggle to not allow my thoughts to run rampant. I knew that focusing on such thoughts only led to worry and anxiety. And that did nothing for my state of mind, or for my family. I had to get ahold of my thoughts. Whatever is true, whatever is noble, whatever is right, whatever is pure, whatever is lovely, whatever is admirable—if anything is excellent or praiseworthy—think about such things. Whatever you have learned or received or heard from me, or seen in me—put it into practice. And the God of peace will be with you. (Philippian 4:8). When we focus on what is true, noble, right, pure, lovely, admirable, excellent and praiseworthy, we experience God’s peace. While it was important to inform myself of my diagnosis and explore my options, it did me no good to worry about the outcome. I had to balance my intake of overwhelming, often discouraging, information with what I know to be true and right…the Word of God. “We demolish arguments and every pretension that sets itself up against the knowledge of God, and we take captive every thought to make it obedient to Christ.” (2 Corinthians 10:5). 1. Read Scripture. I’d like to say my Bible reading was consistent before I faced cancer, but in reality, the demands of day-to-day life often crowded it out. Suddenly, I was desperate, and I needed to hear from God. Bible reading became a priority once again. 2. Write Scripture. As I came across passages I needed to cling to, I printed them out (or just wrote them on notepaper) and taped them to my mirror, my refrigerator, in my car…anywhere I knew I would see it daily to remind myself of God’s Word and His promises. 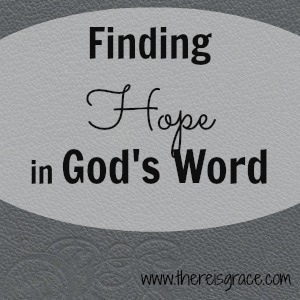 This post is part of the series, Embracing Hope, where we look at why we can put our hope in God, how we put our hope in God, and what we can do when it feels all hope is lost. To view the entire series, click here. Great tips, Nancy! It is imperative when we are facing challenging situations, for us to focus on HIM and not our struggles and problems however big they may be! And there is so much power in His word. I love the verse, “set your mind on things above, not on earthly things.” It’s so important, and it’s the only way that we can have peace or comfort in this life. PS–I’ve always loved Philippians 4:8. I love the fact that it follows Philippians 4:6-7…”be anxious in nothing but in everythingby prayer and petition, with thanksgiving, submit your requests to God and the peace that passes all understanding will guard your hearts and minds in Christ Jesus.”…they really do go hand in hand. Praying that you will continue to be comforted and encouraged through this. Nancy – I love your courage! What a great reminder to be in God’s word and to lean into Him for our hope. You and your family are in my prayers. God bless you. I am so grateful to read your thoughts as I can relate to them so well. I too found myself meditating on the Psalms after my diagnosis. While I was going through treatment, I started reading When Your World Falls Apart by David Jeremiah. He takes a few of the Psalms and picks them apart with the perspective of going through cancer treatment himself. It was amazing for me. Praying for you! Write On! When we bring our thoughts into submission, it gives God the control and gives Him space to come in and make himself known. It isn’t easy but it’s imperative! Great blog post. Thank you for sharing. What incredibly important words you shared! What a great reminder in our dark times and the way to find peace in the midst of the storm. We are from the link up at Deep Roots at Home. It is so nice to meet you. Would love to have you over to our place at http://rosevinecottagegirls.blogspot.com and thelifeofanotsonormalamericanteenager.blogspot.com sometime. My sister and I blog there together. We are new followers on FB. Wonderful thoughts about facing the unknown. Life is so often unfair and makes no sense, but God’s Word always brings answers and strength in times of trouble and confusion. No matter what we have to go through in this life, if we have put our faith in God, we know He will walk with us every step of the way.